Spago's landscaped garden patio, enclosed from the outside, sits to the right of the main dining room as you enter it. Gracious trees are adorned with small lights and space heaters are placed throughout to ensure guests' comfort. 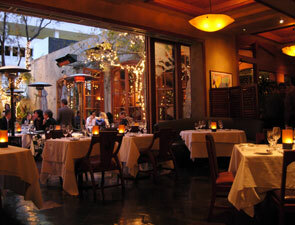 Glass doors and windows separate the area from both the bar and the main dining room; the doors can be opened for easy access to the outside, giving tables near them a unique outdoor experience from within the restaurant's interior. When the doors are closed you can see the beautiful glass, which is etched with branches with leaves. There's even a fountain. Directly opposite Spago's landscaped garden patio is the window-lined wall that separates the kitchen from the main dining room. Behind the colorful etched glass and wood framed windows - yes, they take up an entire wall - is the kitchen, in which you can see all the action. The beautiful glass windows, adorned with colors and whimsical designs, do not detract from your view of the bustling chefs as they prepare your meal; in fact, they make it seem all the more fanciful. 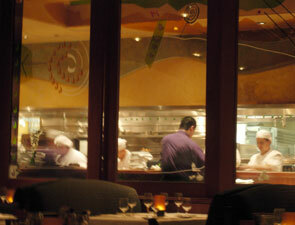 Upon looking through the windows, you can see everything, from the delivery of orders by the wait staff to the preparation of plates before they're taken out to customers. Plates with colorful patterns, including fish, line the wall above two of the windows on either end of the kitchen. The windows are perfect because you get a complete view of the kitchen - without the heat!